At the end of 1916, Curtin secured a position as editor of the Westralian Worker, the paper of the labour movement in Perth. Elsie followed him west and they were married 'by arrangement with the Registrar General' in the house of a Justice of Peace, Mr Penna, in Leederville on Saturday 21 April 1917. Elsie wore a cream silk suit. There were only two witnesses to the ceremony, David Watson, the managing director of the Worker, and Enid Marks, a receptionist at the newspaper, whose father was proprietor of the Iron Duke, a boarding house in East Perth, where Curtin stayed before his marriage. After the wedding the bride and groom and their two witnesses went to the Moana Cafe for tea and cream cakes. But there was no honeymoon. That evening, Elsie and John drove with Alex McCallum, the State Secretary of the ALP, to a political meeting at Midland, where John spoke. As Worker editor, John earned a salary of seven pounds a week, but out of this, he sent his parents in Melbourne two pounds ten shillings. 28 The couple moved to a rented house, firstly in Subiaco and then in Cottesloe. Elsie soon took over the family finances. Under her careful stewardship, sufficient of John's pay was put by to enable them to purchase a house in Napier Street, Cottesloe, for themselves and their two children, Elsie (born 30 December 1917) and John (born 31 January 1921), as well as providing a home for Elsie's parents, who lived with them from September 1919. It is likely that the house was paid for at least partly by money from the sale of the Needhams' Hobart house and business. Abraham Needham wrote material for the Worker, especially during a period in 1919-20 when John collapsed from nervous exhaustion after his second unsuccessful attempt to enter Federal Parliament. 29 In 1922, Abraham Needham suffered a heart attack and died. He was 62 years of age. 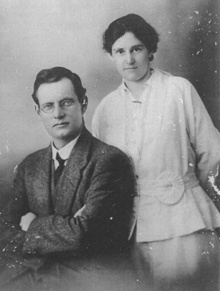 Elsie and John Curtin, October 1917. 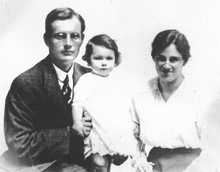 John and Elsie Curtin with their daughter Elsie aged 15 months, 1919. John and Elsie Curtin with their children Elsie and John, 1922.